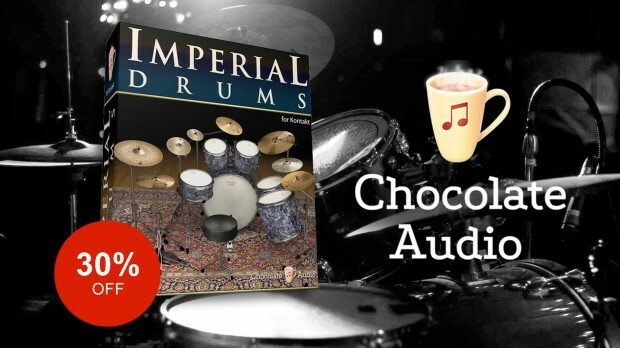 Chocolate Audio proudly release Imperial Drums for NI Kontakt. Get 2+ full drum kits played with 13 different sticks/beaters, and over 150 drum pieces with this superb drum library. Available now at an affordable introductory price of only $69! Get Chocolate Audio’s Imperial Drums Here ! These drums have a majestic sound. They have been captured with state of the art equipment with great attention to detail, which is the trademark of all of Chocolate Audio products. The included instruments provide ambient and direct mic recordings for you to fine tune the space you need for your tracks. There are also many 13 stick and beater types including hot-rods, webs, rutes and jazz brushes to customize your sounds to fit the style you need. All the included drums, cymbals and hihats are expertly set up and tuned by experienced session drummer Elio Rivagli. With over 150 loadable instruments in total, Imperial Drums’ sounds are suitable for all genres of music that demand powerful, musical-sounding drums. * Some of these audio demos are tracked from the BFD version of Imperial Drums (marketed by Fxpansion), but the two share the same exact sample set, hence they testify the kind of sounds one can achieve. This entry was posted in DontCrack, Promotions, Virtual Instruments and tagged Chocolate Audio, Drum Kit, drum library, drum sample library, Drums, Imperial Drums, virtual drums. Bookmark the permalink.